In an effort to further personalize search results, Google is now including more Google+ data into its online searches through an initiative called “Search plus Your World.” PCworld.com reported on how users will start seeing more Google+ profiles, posts and business pages whenever they are signed in to their Google accounts. 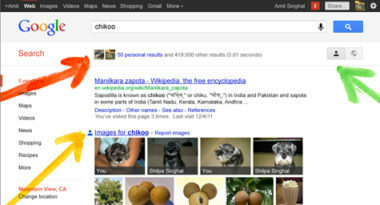 Google designed Search plus Your World to find content that has been shared with users on Google+. The feature also retrieves information from the social networking site related to a particular search, then incorporates all of these findings data into the user’s search results. This new Search plus Your World feature will focus on finding three types of results. The first is Personal results, which include Google+ data that has been shared with a user, along with Google+ posts and photos. To protect users’ privacy, only the user will be able to see their own private posts and photos. The second type is Profiles In Search, which means that users can search for people they’re connected to on Google+ along with famous names. Finally, People and Pages results are the results from Google+ business pages and prominent Google+ users. While Google has been proudly promoting these changes, the move has brought up concerns about Google prioritizing its own content over linking to third-party Web sites. Twitter has been very vocal about its opposition, yet the micro-blog did not renew its search results contract with Google which nullifies its argument. A larger concern is the possibility of anti-trust issues since Google is basically promoting its own social network by favoring Goggle+ data in its search results. For now, Google is moving forward with its new Search plus Your World feature as the world waits to see the results. To learn how search marketing can improve your company’s visibility and marketing ROI, contact MDG Advertising.